Yes, I have a thing for Kohlrabi at the moment. I get nervous when I don’t have a bulb lying around. And I’m constantly trying to find new recipes to use them in. But more on that later. This autumn, I’ve discovered, to my own surprise, that I prefer autumn and winter vegetables to summer vegetables (tomatoes probably being the only exception). The variety is huge, the flavors and colors are so inspiring and exciting. For a long time, at least here, the typically Mediterranean vegetables, like aubergine and zucchini, have been The Thing to cook with as they’ve been promoted as part of a light and healthy cuisine. And a lot of people, including me, have been using them throughout the seasons in their cooking, which left little space for the local seasonal produce, like all sorts of cabbage, turnips, beets, parsnips, Jerusalem artichokes, squash, kohlrabi and all the other beauties that are so abundant here in autumn and winter. A lot of magazines, cookbooks, and of course blogs, now feature recipes with these beautiful vegetables and this, combined with my efforts to buy and cook local and seasonal, have thankfully made me (re)discover these flavors. Now back to the Kohlrabi. I really wanted to use it in a quiche or tart, but while browsing the internet, I couldn’t find any recipes that sounded particularly appealing (at least they didn’t address the particular craving for something hearty and rustic I had at that moment). So I came up with this recipe that I based on the two main ingredients I wanted to use, kohlrabi and minced meat. The rest of the recipe came together as I worked. I’ve now made it several times and had the opportunity to twist around a few things. For example, I found that it worked even better with a high edge crust than with a typical tart crust as the filling turns out even more juicy. The dimensions I used in the quiche as photographed are a ø 22 cm tin with an approximately 4 cm high edge. But you could of course make it with a larger crust in diameter and a lower edge. Carefully place the crust in your baking tin. Cover the crust with baking paper and dry beans or baking weights and blind bake for 15 minutes. In the meantime, heat the olive oil in a frying pan over high heat. Add the minced beef and brown it, stirring frequently until it’s cooked and evenly browned. Reduce the heat to medium. Add the onion and fry until translucent. Add the garlic, kohlrabi and carrot and fry for two minutes, stirring from time to time. Add the beef stock, cover the pan and simmer for about 20 minutes or until the kohlrabi has softened and the liquid is absorbed. Add the cumin and adjust the seasoning with salt and pepper if necessary. By now, the crust should be ready to come out of the oven. Discard the beans and baking paper and set the crust aside until the filling is ready. While the mixture simmers on the stove, break the eggs into a bowl, add the cream cheese, cream and milk. Season with the grated nutmeg, salt and pepper. Whisk until everything is well combined and the mixture is showing some bubbles on the surface. As soon as the Kohlrabi-minced beef is ready, evenly spread it over the crust and pour the egg-cream mixture into the tin. Sprinkle with parmesan, push into the oven and bake for 30-40 minutes. The top should be golden and the tip of a knife should come out of the quiche more or less clean. Take the quiche out of the oven and let it rest for 5 minutes before taking it out of the tin. Serve with a green salad and enjoy! I’m stuck at home with the first big cold of the season. Runny nose, sore throat, headache, fever…the whole package. Even my face hurts. And the worst thing of all is that my taste buds are completely out of order. I just had a “tarte flambée”, a very thin crust topped with sour cream, onions and bacon, a specialty from the region of Alsace in France, for dinner and I could just as well have eaten my shoes. It would have tasted the same. Fortunately, my husband assured me that it tasted great and that I’d have to make it again so I’ll have another go in a few days. 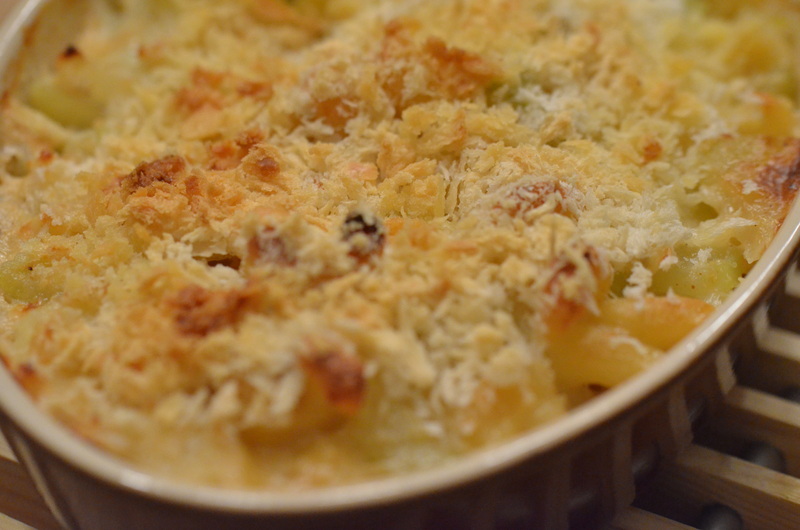 Thankfully, my taste buds were still functional a few days ago, when I made this pasta bake. I found the inspiration in the current issue of the french Saveurs Magazine where they presented a simple macaroni Gorgonzola pasta bake. It looked very tasty, but to have it as a complete meal, it lacked some vegetables. Kohlrabi sounded like a nice addition and I was pretty sure that its crunchiness and taste would complement the creaminess and strong flavors of the Gorgonzola very well. 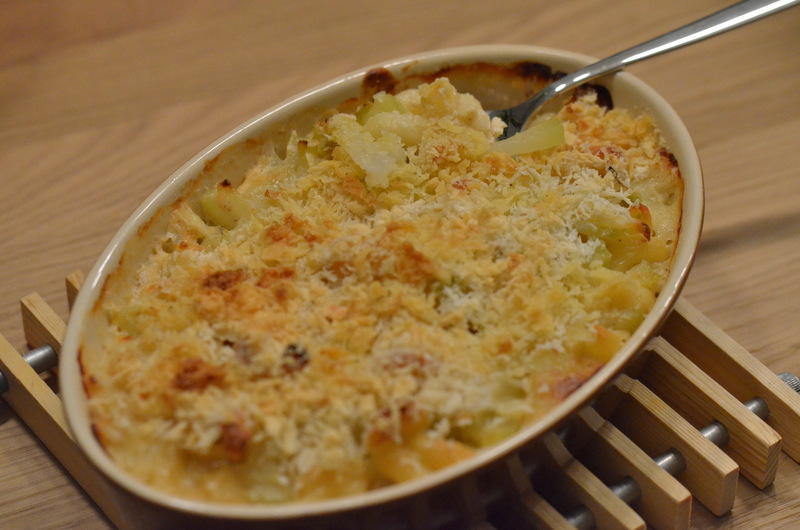 Topped off with some panko, this was a delicious pasta bake, perfect for cold autumn evenings. * It can be a bit more or a bit less, depending on whether you want your sauce to have a strong blue cheese or not. It’s best to add it in little bits and check the taste as you go. Peel the Kohlrabi and discard the stem (hard and stringy bit at the bottom). Cut it into little cubes. Put the pasta into a pot and cover with the milk. Season with salt, pepper and nutmeg to taste. Turn up the heat and bring to a boil. As soon as the milk is boiling, reduce the heat to medium high in order to keep it bubbling. Watch the mixture at all times as boiling milk goes over board very quickly if you don’t stir it frequently. When you’re halfway through cooking your pasta, add the Kohlrabi cubes to the milk and continue the cooking process until the pasta is al dente. I like the Kohlrabi to preserve some of its crunch, so a few minutes in the boiling milk are enough. If you want it to be completely cooked through, just add it to the pot a little sooner. As soon as everything’s cooked to your liking, remove the pot from the eat and add the gorgonzola in spoonfuls. Stir the blue cheese into the mixture until everything is well combined. Taste and adjust the seasoning if necessary. Pour into an ovenproof dish, sprinkle with panko or bread crumbs and arrange several knobs of butter on top. This will make sure the crumbs become crisp and golden during the baking process. Bake in the oven for about 30 minutes until the top is golden. Take out, let sit for 5 minutes to let it cool down a bit and enjoy!